If you have two or more Google accounts, and in one account you have set up a Blogger blog, you may need to transfer that Blogger to another Google account, only because it was created in wrong Google account by mistake ! If you get above situation, make sure do not delete the blog and create a blog in another Google account with same domain name- it will not work ! Though the blog has been deleted, Google does not release it's sub-domain name for re-use. Google actually hold that sub-domain in somewhere and nobody can apply for that name! What you can do is, transfer/ move that blog from the current Google account to another Google account you own. By default, there's only one author available for your Blogger blog, the author is your Google account name with Gmail address as email, and has 'Admin' right. 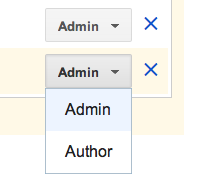 You can add your 2nd Google account (Gmail account) as another author for the blog, and assign it as 'admin' as well. Once your 2nd Google account has been assigned as 'admin', you can then login to the blog by using the 2nd Google account, and remove the 1st Google account from the blog author list, so that only the 2nd account left on the author list as admin. Next time when you login to the 1st Google account, you will not be able to see the Blog any more. To transfer Blogger blog from Current Google Account to the 2nd Google Account, we will need to login to both 2 Google accounts (Gmail accounts) at same time- you can do this by opening the 1st Google account (current) Blogger account in Firefox, and opening the 2nd Google account in Chrome. 1. Open Firefox, login to the Blogger blog you have. From Blogger dashboard, (screenshot below) click on Settings->Basic->(you will see a Permissions section at right) click on +Add authors -> type in your 2nd Google account (Gmail account) in the empty box, then click on Invite Authors. Once you clicked on 'Invite Authors', a email will be sent immediately to your 2nd Google (Gmail) account, ask you to confirm that you'd like to be the author for this blog. 2. Open Chrome, login to Gmail by using the 2nd account, open the new Invitation email from the 1st account, click on the confirmation link inside the email to confirm that you'd like to be the author for the blog. 3. Switch to Blogger account in Firefox (the 1st account), refresh the dashboard, go to the Settings->Basic, look at the Permissions section, you will see the 2nd Google account has been added on the author list. Click the drop-down menu next to the 2nd Account and choose "Admin. "- this will assign the 2nd author as Admin for the blog. 4. Switch back to Chrome window (the 2nd account), go to Blogger by typing Http://Blogger.com in the address bar at the top of the Chrome. From your Blogger dashboard, go to Settings->Basic, look at the Permissions section, you will see the 2 Google accounts on the author list. Now, delete the 1st author from the author list. 5. Verify: Switch back to Firefox (the 1st account) window, typing Http://Blogger.com in the address bar at the top of the Firefox- you will not be able to the blog any more- it has been move to the 2nd account ! You can transfer / move Blogger blog from one Google account to another, by adding the 2nd Google account into the blog author list, assign it as 'admin', then delete the 1st Google account from the blog author list. Have you ever tried to delete, and re-create a blog in 2 different Google accounts? Share your experience and insights in the comments box below. The second gmail account does not show up (step-3).